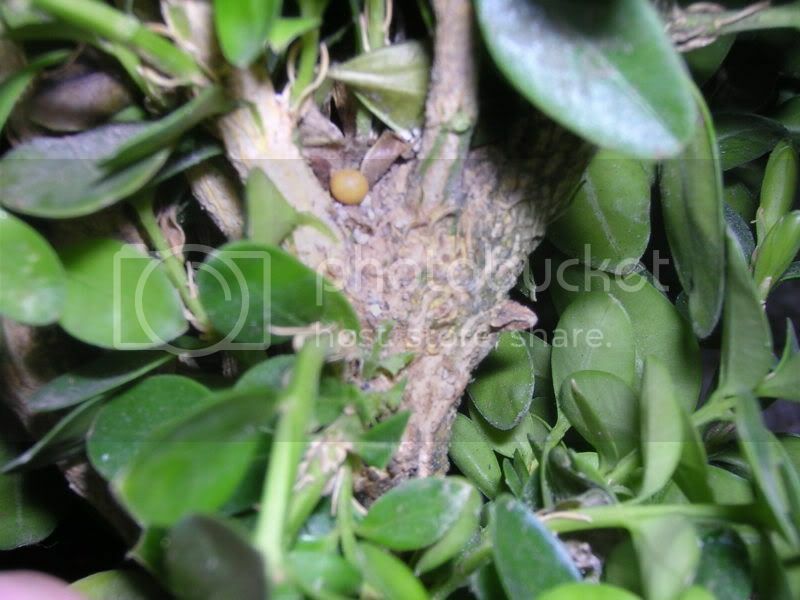 Well, he are pics of the boxwood, as promised. Here is a close up of the roots. and these next two are just soem that are zoomed in a bit (the second one's a little blurry, sorry bout that but i'll post it anyway. can't hurt). i bought this one, because i liked the roots on it, and i thought it had the best form what i looked at. also, it had a single trunk, not a giant junction point like may others did (i think this has the beginings of taper). 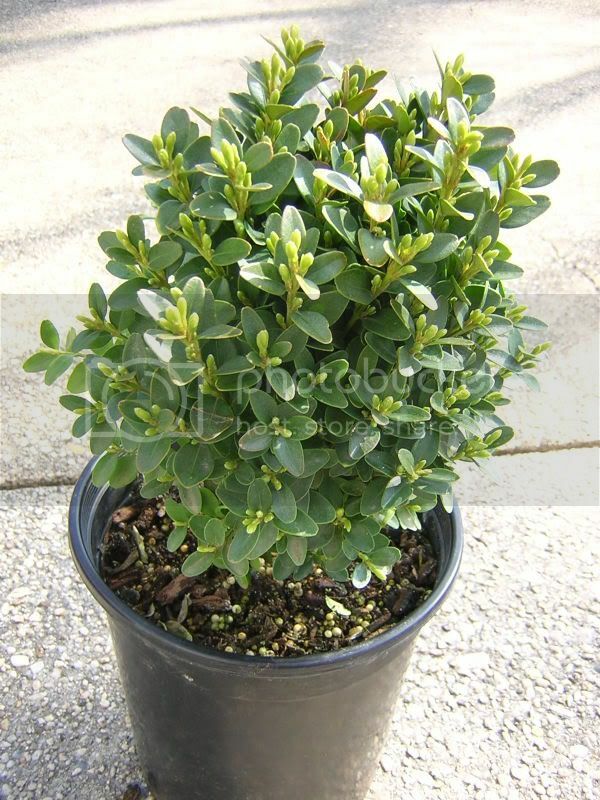 It is an english boxwood, and i paid $5.99 for it. I'm not sure how to style it, i was thinkign maybe informal upright (see how the trunk curves a little bit) with that one branch possibly becoming the continuation of the trunk. not sure yet. Any ideas are appreciated. P.S. if i can figure something out i plan to repot/style this thursday, (or this week) and i will post pics when i do. OH, a pretty tree. i like it nice pictures too, i love pictures! These trees have good potential, and this one is no exception. Make sure you really get in there and take a look at the branches before you do any pruning. Good luck. Just some more pics of the branch structure. 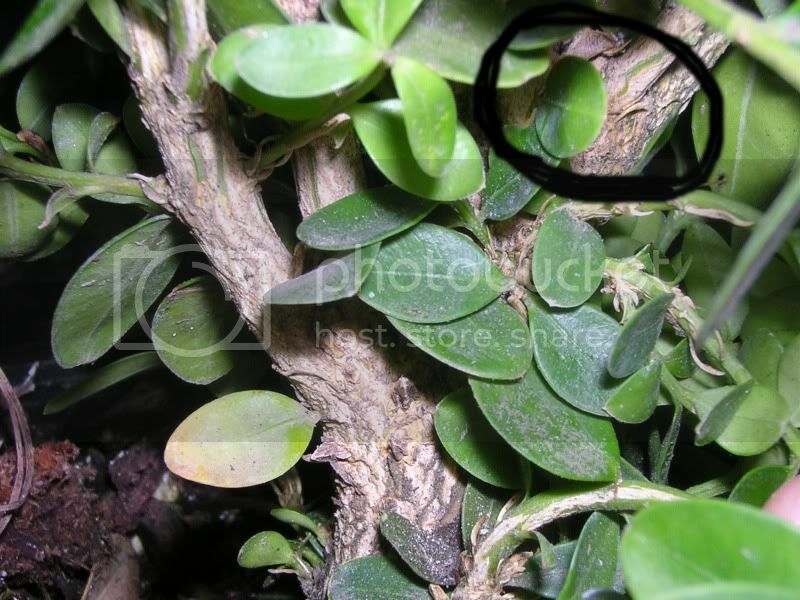 the second one is a oomed in pic of the circled area on the first. constantstaticx3 wrote: These trees have good potential, and this one is no exception. Make sure you really get in there and take a look at the branches before you do any pruning. Good luck. After its initial heavy pruning you will be able to make quite a bit of progress via pinching and pruning in one season with this guy Joe. 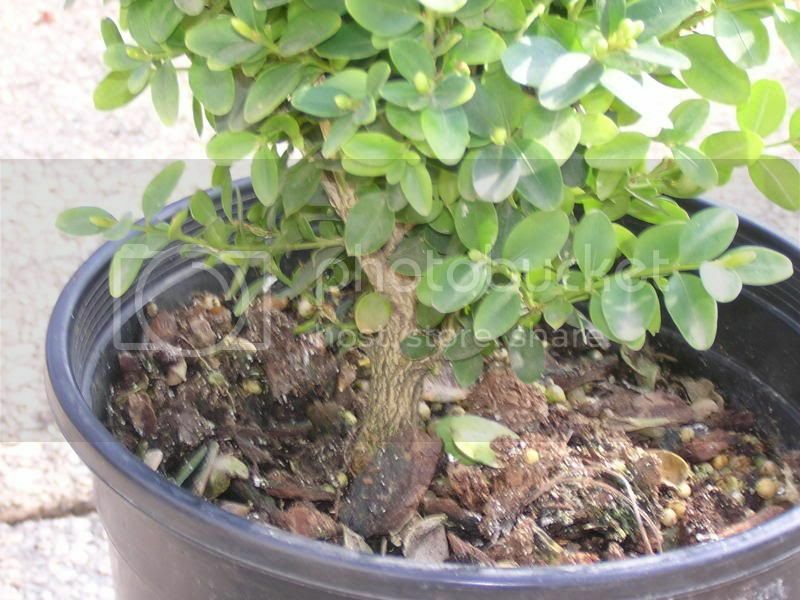 Are you planning a repot into good soil soon? Or is that next years project? Joe, Which did it say this was on the tag? 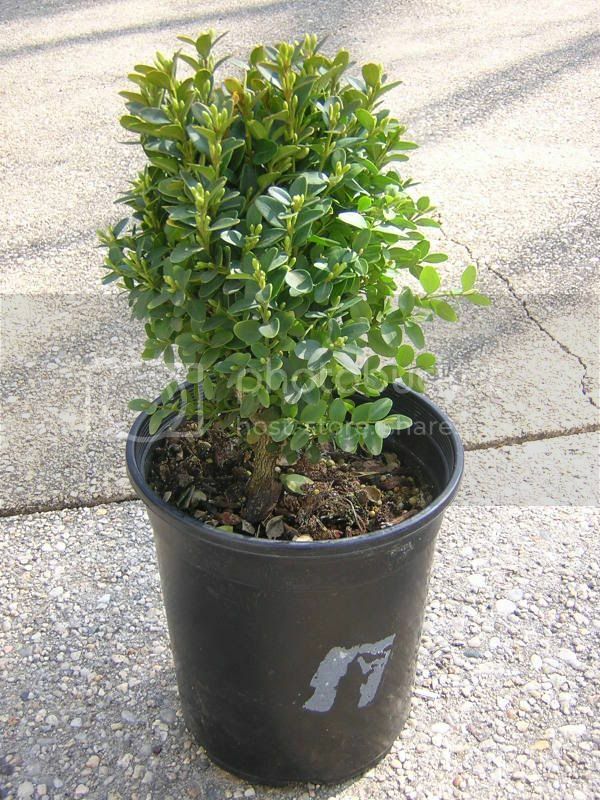 Buxus microphylla or Buxus sempervirens. I ask because the microphylla grow slower. Into what potting medium? Same pot? and I think I will trim a lot of the foliage, really just to see what the branches look like (right now it's a mess). Are you talking about defoliation? Again, Are you talking about defoiliation? Why did you decide to do that. As to the brown comment above... You are going to have to do quite a bit of pruning/pinching this season, Please address my questions about defoliation though as I am curious where that idea came from. 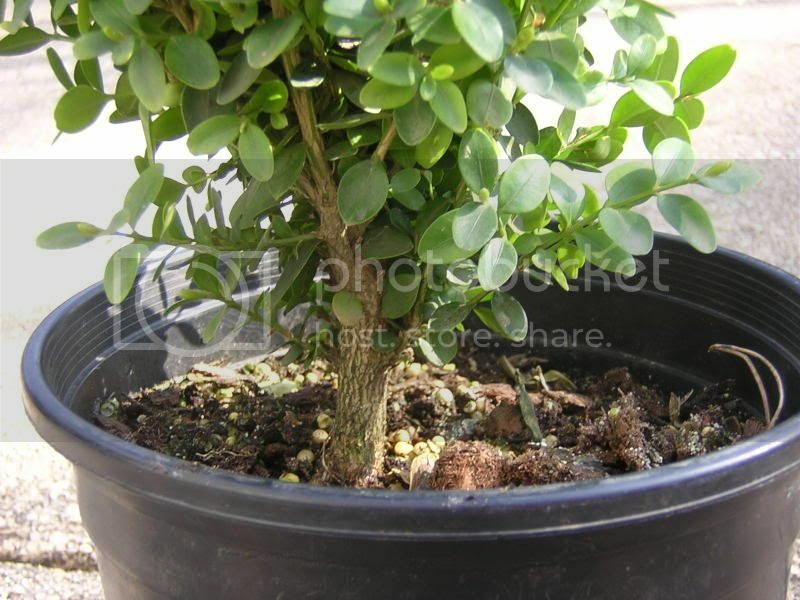 different soil (bonsai soil), different pot, but roughly the same size. different pot, but roughly the same size. Well maybe I was being drastic, I think I miscommunicated. I just want to remove enough leaves so that I can see what the branch structure looks like, and so that I can see what I'm doing when branch pruning/wiring, which will porbably happen soon as well. um, Ok. Just be sure not to eliminate something you want. You are going to do this within a short time interval, Right? Well, Then you have to spread it apart with your hand and get a nice preview of what's in there. ~ That is certainly easy enough to do. I think this: "Do not make your tree look like a bonsai, Make your bonsai look like a tree"
This is what I meant in my first post. You really want to be careful that you don't remove something that you want. I'm sure there is a great tree in there you just really have to be careful and plan it correctly. You should try and do this in a day or two. Maybe prune and wire one day and then repot the next. It's beginning to grow so get it to where you want as soon as possible so it can start to grow according to your design and not put its energy into branches that you don't want. Tommorow forecast is rain, so i won't do any work on it (i do bonsai stuff outside), so i'll plan what i want to do. Thurday, i'll begin working on it, wiring, pruning, etc. Friday, i'll do any finishing touches on wiring, and re-pot. If I'm overeager (which i am), i may repot it thrusday after shaping. As always i will post pics. Hmm, I am used to Gnome posting just before me... But you also Tom? 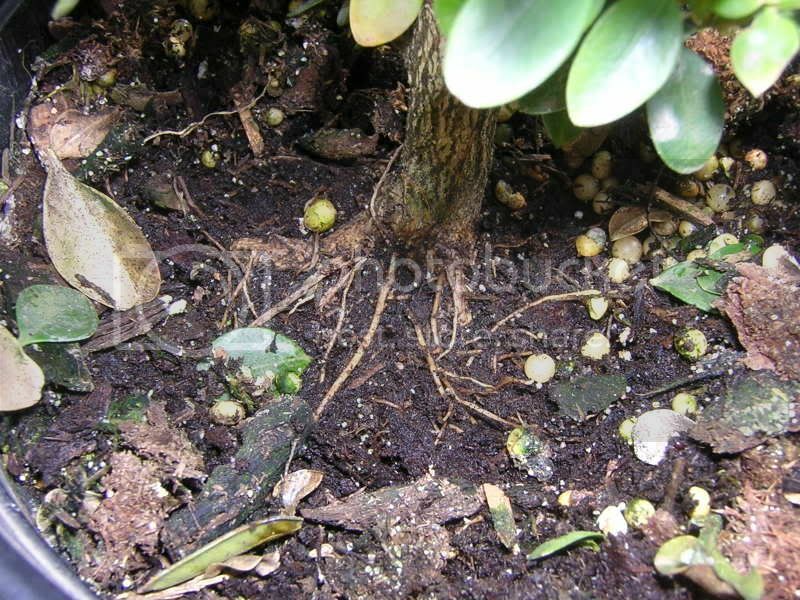 Joe, When you mention a 'repot' Are you including a rootpruning with that or not? Again, I am curious as to your intentions. lol, I'm really starting to get into this, its a lot of fun . constantstaticx3 wrote: lol, I'm really starting to get into this, its a lot of fun . 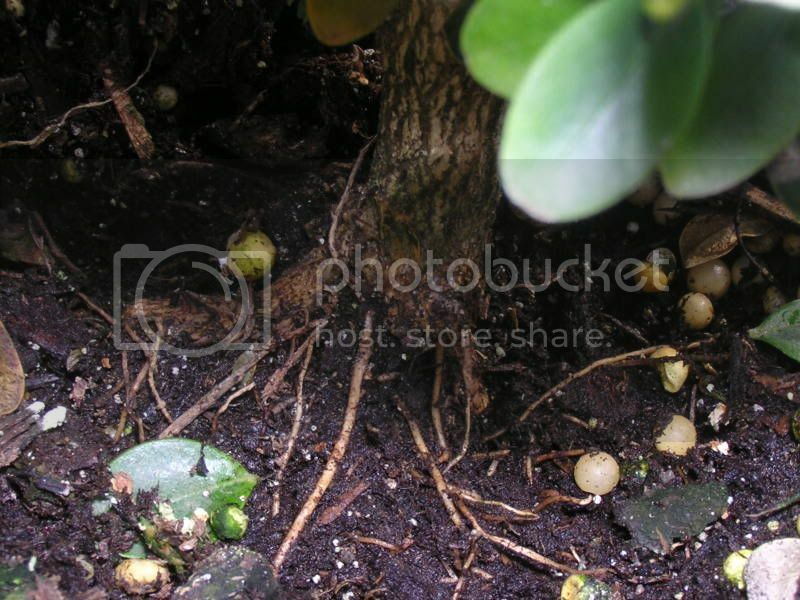 no, i don't intend to root prune, just to get it into bonsai soil.